Our generator died. Ryan started it up and it would cough and sputter in a sickly idle. The generator did not rev up. Two months in Panama sitting unused did our reliable Honda in. Since we are dependent on the generator to run our watermaker, getting it running or replacing it was going to be necessary and is not necessarily an easily accomplished task in Central America. Some fellow cruisers we have been crossing paths with since La Paz had arrived in the marina shortly before we splashed back in the water and had mentioned their Honda had recently experienced a catastrophic pull-string failure so they purchased a new one. I decided to ask where they purchased the new one in the hope of not having to make Ryan try to board an airplane with a suitcase generator as a carry-on. They kindly gave me the information and offered to give us their old generator to either repair or use for parts. Ryan was able to replace the carburetor in our generator with the gifted one and it works like new. This saved our bacon. It was not the first time we have been overwhelmed by the kindness of other cruisers. In Zihuantanejo, the girls and I needed to replace a frayed alternator belt and simply lacked the necessary strength and arm length the loosen the bolt. A quick call for assistance on the VHF and three other boats in the anchorage were there within ten minutes to help us out. In El Salvador, our outboard died after getting some water in the fuel. A walk down the dock and people were offering parts and assistance. Whenever someone is in need, there is always someone willing to help. We, cruisers, are traveling to remote parts of the world, usually in a foreign country, by boat. Oftentimes, we aren’t native speakers of the local language and procesess for legal formalities aren’t well-documented or are in state of continuous fluxutaion. It is important to help when we can and to openly share our knowledge and experience so others can learn from our success and failures. This openness and willingness to help each other regardless of age, flag, color or gender is one of the things I really love about the cruising community. The past few weeks, getting Waponi Woo back in the water in a place I am increasingly disenchanted with have been difficult. This unanticipated act of kindness, the gift of a generator, served as a wonderful reminder there is a lot of good in the world. 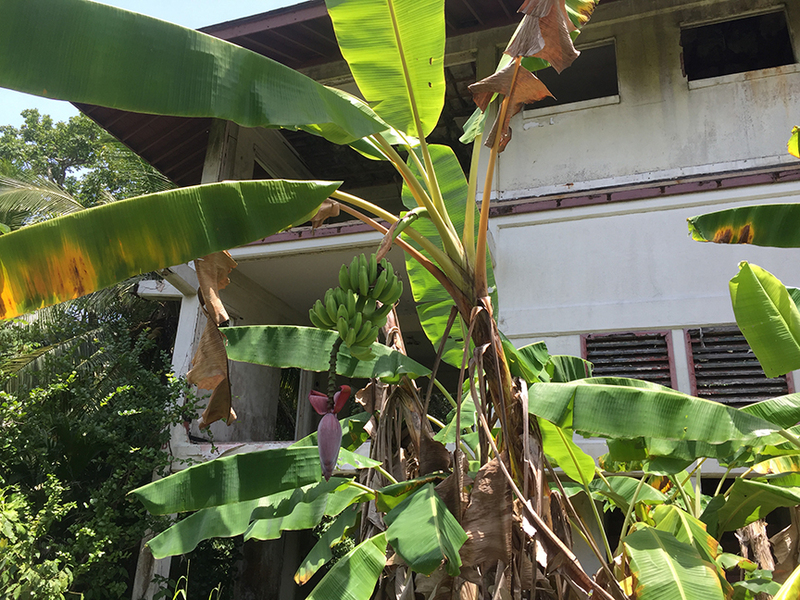 A token snapshot of a wild banana tree growing next to what is left of Ft. Sherman base housing. This entry was posted in daily life, Uncategorized on October 4, 2018 by Caroline Spott.